Francis Smylie/Smiley 1689 → Hugh Smiley 1723 → William Smiley 1757 → Hugh Smiley 1785 → Shepherd Parkman Smiley 1828 → Thomas Alexander Ward Smiley 1867 → Clara Grace Smiley 1911-1997. 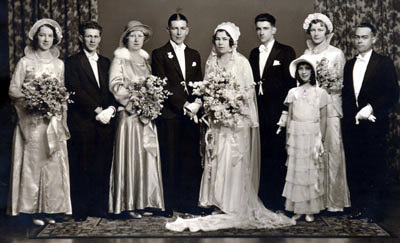 Married: James McKnight Moore, 19 Sep 1931, East St Kilda, Vic. Clara (Clare) Grace Smiley was the tenth of the eleven children of Thomas Alexander Ward and Marion Harley (Bunn) Smiley. As her father shifted the family often to cater for his work as a boring (drilling) contractor, her childhood saw her living in a variety of locations and houses. 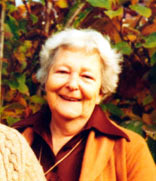 Along with others in her family, Clare attended Brighton Road State School at St Kilda. As a young adult, she was walking along the beach at St Kilda with her sister Jean when they met two cousins, John (Jack) Nixon and James McKnight (Mac) Moore. Jean was to later marry Jack, and Clare married Mac. Mac, who had been a butcher and in later life became a shipping clerk, was a son of Camperdown hairdresser James Moore and his wife Leura May Cecilie (McDonald) Moore, and was born at Camperdown on 3 October 1908. He and Clare married at East St Kilda Congregational Church on 19 September 1931 when she was aged 20 and he 22 [click on photo to see a larger image]. They had five children. Mac joined the Army during World War Two, and during this time Clare, with three young children, moved from Melbourne to Red Cliffs, where two of Clare's sisters were living. They returned to Melbourne following the war. The couple had separated before Mac died at Heidelberg on 8 May 1965, aged 56. Clare died in Melbourne on 27 March 1997, aged 86. I can remember my sister Lorna telling me about when I was sitting in a high chair as a baby. I was too young to remember, but I evidently didn't like the food or something, and I just pushed the plate and food onto the floor. Our brother Doug was a very gentle person, and he said "she didn't mean it, she dropped it." I can remember when we were children - the Four Little Girls we were called - Jess, Jean, Bid and myself, and if we got a penny or a halfpenny we thought we were very lucky. Up the street from us was a shop run by a lady named Mrs Kay. She was so used to us, that she used to have a penny tray and a halfpenny tray, and when she saw us coming she would say, "what is it today, a penny or a halfpenny tray?" If we had a penny we were made, as we could buy Silver Sammies, Silver Sticks, or an amazing number of lollies. But it didn't happen very often. When we were young we all went to Brighton Road State School. The teachers got a bit sick of all us Smileys, I think. I can remember three elderly (to me) ladies, in the sixth grade - Miss Wilby, Miss Hannah and Miss Webster. When I went into the class after all the others had been ahead of me, they said "cripies, not another Smiley," and I felt it was a disgrace to be a Smiley. In the 7th grade there was a chap called Mr Newey and I asked one day if I could leave the room. He said "certainly," and I got as far as the door when he said "what do you think you are doing?" I said I had asked, but he said "you said can I, well, anyone in this world can do anything, but you should say may I". Well, ever since then I have said "may I" because I was in a desperate hurry! Mr Tanner, our 8th grade teacher, was a very good teacher. I was very lucky, as two of us got recommended for our Merit Certificate so we didn't have to sit the exam. School was a bit different then, as when we got to the 6th grade they gave us an exam and we got the Qualifying Certificate if we passed. When we got to the 8th grade it was the Merit Certificate. During our school days, Mother always insisted on us coming straight home from school. So we would all be doing the right thing but Mollie (Bunn) would say "just come home for a few minutes and have a little game." So I would think I would stay for about 10 minutes, but of course time would get on and I was always late home. Jeannie kept telling me I would get into trouble, and I did, and I spent more time upstairs on my own! It was funny in those days, as people had their meat delivered. At first there were two horse and jinkers for deliveries (from the family butcher's shop), and they were eventually replaced by two cars. The shops were quite a good business. I can't remember when, but when we were young there was a flu epidemic, and to get out of the city Pop got a house at Upwey for us and we stayed there for about six weeks. But I was allergic to mosquitoes and I had bites on my face and my hands. I was a terrible mess, and all the kids were calling me Monkey Face because my face was so swollen. It ended up I had to go back to the shop and stay with Pop because I couldn't stand the mosquitoes. When we lived in 127 Hotham Street, we were playing hide and seek one day when I found that someone had left a ladder against the wall. I thought I would hide on the roof. But when it was time to get down I found it was not such a good idea, because I was scared stiff. So I called out to my brother Phillip as he came round the corner and he called back "You got up there, you dope, you get down!" But I do think he relented and helped me down. And then when we lived opposite in Hotham Street, St Kilda, where it had stables, Mother used to let us have little fires which the boys used to help us with, and we used to throw potatoes into the fire to cook for lunch, and they were beautiful. We used to go down to Black Rock each year, and on one trip one of us had to go back with Pop to the shop, as we were working at that time. Pop had said he was going to leave about 9ish, and Mac (Clare's boyfriend who later became her husband) and I were up on top of the cliff on the swing, and all of a sudden Jess came up and said do you know that Pop is waiting for you? He sure was. One of the times down at the beach we got to know the grocer boy and Mollie (Bunn), Jean and I were going for our last walk before returning home and we met this boy with his friend. They invited us to go for a walk along the beach, and so we five walked off, and we were sitting on the beach talking and laughing when we saw Pop coming along the beach. He just said "righto girls, home" and we got up and didn't even say goodbye to the boys who were looking quite stunned. I remember one of my Mother's birthdays, when my Father bought her a beautiful fur coat. And she said it was ridiculous that with all the children, she should wear a fur coat. Pop must have paid quite a bit for it, because it was returned to Myers and exchanged it for ordinary coats, and everyone in the family got a new overcoat. It showed what a practical person Mother was. We always had wonderful family gatherings at Christmas and New Year; it used to start off at our place and then as the families got too big we used to hire a hall. But it was funny how the Smileys always used to end up in the kitchen, and we have been doing it ever since. The Oppermans, Carl and Marge, were marvellous and were always there. The parties would include dancing, and at one gathering when I was expecting Cynthia, Auntie Mabel (Mabel Bunn) was a bit of a fusspot (not like our Mother), and when she saw I was dancing the sets she nearly had a fit, she said I shouldn't be doing that. (But Cynthia didn't arrive any earlier, so it didn't matter). When Rod was about 6, he was up at Tempy and for some reason he had to come back to Melbourne and he was going to stay with Mother and Father. He was in the care of the train guard of course, and the people on the train, but he was so frightened. When he got to Melbourne, one of the ladies in the carriage said he was so frightened he might leave something behind that a couple of hours before the train got to Melbourne he put on his overcoat and schoolbag. He was a very hot little boy by the time he got to Melbourne. Later Rod belonged to the Boy Scouts and on one long weekend he went away into the bush, I think around Warrendyte way, and we decided to go and see him on the Monday. I have never seen anyone so bedraggled and dirty, and he said, "I am dying to get home and have a bath." They hadn't been able to go in the river at all because it had been raining all the time and it was freezing cold. He came home on Monday night and said "I don't want anything to eat, I just want a good hot bath to get all this dirt off me." I never got a licence but I used to drive the car. Doris was beside me all the time. She used to prefer to nurse Cynthia and I used to love driving. I used to drive Rodney to school across Harry's paddocks (Harry Wilson, husband of Doris). Jeannie's husband (John (Jack) Nixon) and mine (James Macknight Moore) were cousins. We met them together one day when we were going for a walk along the beach at St Kilda and from then on they used to come back to our place for dinner a lot, and that's how we started to go out together. The four of us used to go out to the theatre in Malvern, because Mac could get in for free. Jeannie and Jack and Mac and I used to go to dances, but we had to be home by 11. But I would be enjoying myself, and Jeannie would say "we had better go." I would say I would have a couple more dances, which I did, and of course Pop would be waiting at the front gate for us. Mac would always meet me after work the next day to see how I had got on, because Pop would just say "right, inside Judy!" But inside the house he would never say a word other than "go to bed". Pop never hit any of the girls and was really a gentle person, but we always expected the worst. We used to have lovely dances at the church hall, once a month I think, and knowing everyone it was a lot of fun. The church hall was behind the church and so was very close to where everybody lived. We also used to go to the Palais, Leggetts and St Kilda Town Hall - they were very nice places. We used to have frocks with waists that would go nearly to our knees. Hilda Pegler was a very good dressmaker and she used to make a lot of clothes for me. Because she hated housework and I loved it, I would go to her place, clean it up, do her dishes and everything, and she would make my frocks from material I would take along. Stan (Pegler) would come home while I was waiting for Mac to pick me up in the motorbike and side car, and as Stan walked in he would say "hello, Peg's here, the place is clean!" Another thing Mother believed in was training us to be a housewife (it didn't make much difference for me). As each one of us got engaged, she used to keep us home for 12 months so that we would learn the ropes. We used to have great times at the Christmas parties and would play competitions, say one side of the hall against the other. I think our family was so smart we always won - that's a lie, of course! Sometimes at the parties we would put on concerts and when we were talking about this recently Cynthia said she could recall Rodney and Barrie (Nixon) being "Two Little Girls in Blue." We had rope plaits for them, but I think they may have even had a fight in the middle of it too, one was saying the wrong words! 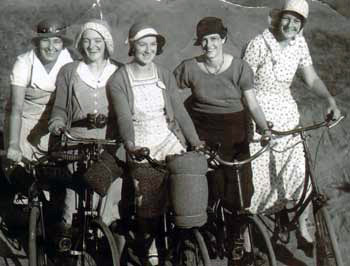 When Mac and I were all young marrieds, we made up a cycling group and we used to go away for weekends. One particular friend, Ray Guthie, joined us with his wife and we used to camp at different spots. One weekend we went to Warrandyte and during the night it rained and rained. We were sleeping against the flap of the tent and during the night Mac had rolled out, and of course he was a bit wet, and he wasn't very happy. But Ray Guthie had black curly hair, and he and Myrtle were sleeping up near where the food was packed. When he woke up in the morning he found the condensed milk had leaked out into his hair - he wasn't very happy about that either. We would go to places like Cowes. The boys had made boxes for our food and tents. One day we were biking down towards Mordialloc and a chap stopped us, and he was a photographer from The Sun newspaper. So we have a picture of Normie Bunn, Hilda Bunn, Bid, myself and Mollie Bunn (click on picture to see a larger image). One Sunday night we came home very tired and Mac and I thought we would have a nice, hot bath. So we ran the bath and sat in the lounge, and the next thing we knew there was water running down the passage. We both had fallen asleep. One of my first jobs was as a sales girl at a large store called Reids, on the corner of Malvern Road and Chapel Street, and I was in the corsetry department, and I ended up being head of the brassiere department. With my first pay I bought myself what I thought was a lovely frock, pale mauve, tight bodice, flared skirt - and I thought I was "it and a bit." And of course we used to have church dances, and the first time I wore it there everyone said how nice it looked. The next time I went to get it I couldn't find it, and I asked Mother if she had seen my new dress. She said "It's where it should have been in the first place, I burnt it under the copper!" I wasn't very happy! I ended up many years later as a telephonist at Chelsea, and when it become automatic we all went into the city. I got sick of the shift work and decided to give it up and do housework, as I love housework, and I worked at some very nice places in Brighton. During the war years, when Mac came back from overseas, he was stationed in Sydney. In those days, you weren't allowed to go across the border, you had to stay put. So I decided to establish residence at Red Cliffs. I stopped two nights with my sister (Jessie) and then Henry (Dadswell) drove me to Mildura and we caught the Murray Valley Highway bus, which happened to be the first bus that went down that particular route, right down the river to Albury. I stayed overnight in Albury and then caught the morning train to Sydney. Mac and I lived in a bedsitter. Cynthia was with me, Tony was with Doris and Rodney was with Lorna. Mac and I had a very hot flat and Cynthia being little, she needed to have an afternoon sleep. The landlady let me put a rug downstairs so she could sleep. During the war years, Jeannie and I both went to Red Cliffs and Jess got a house for me in town, belonging to a Mr Wright. When May came along and there was pruning and wrapping on of vines to be done, there were no men around. I used to get up early - Rodney was going to school, Tony was old enough to be playing around and Cynthia was in her pram - and I used to do the pulling off and wrapping on of vines. It was very interesting, and it was the first time I got good money. Mr Wright was very good to us. He had told us electricity was governed by a slot machine, but I never thought anything about it. I was sitting there and all of a sudden I was in the dark. I wasn't very happy as I was a bit nervous. But then I remembered the slot machine and put a shilling in the slot - and we had electricity again. I can remember when Jeanie was up in the mallee, with the Nixons I think, and Jack had to come back to Melbourne, and he brought Trevor with him and Mac and I minded him. Jeannie has a different version of this story but I can remember very vividly minding Trevor and he wouldn't have a thing to do with Mac. He was alright with me. We had borrowed a cot mattress so he could sleep on the floor but he would not have a bar of it. He used to scream blue murder. So it ended up Mac used to have to sleep on that - and I don't think he was very happy sleeping on the cot mattress - but Trevor was, for he was in Mac's spot in bed! When 44 Hotham Street became too big for them, Mother and Pop were going to sell it and move in, I think, with Doris and Harry. Pop had had the whole place done up for selling, and I presume he wasn't very thrilled to find that Rodney, who used to have an afternoon sleep, had had a little accident in Phil's room, and had proceeded to paint the walls and wicker chair. My father was a very patient person but I think that was one time when he lost his patience. We were robbed a few times when everyone was away up at Tempy. But one time Phil happened to be stopping home and as he came in the front door at 44 Hotham Street he saw a chap duck down the hall. But he had gone the wrong way and had got trapped. When he came out he was very sheepish, and he said he hadn't taken anything. But as it happens, after Phil had let him go, he found the man had taken a whole heap of little pieces of jewellery. Our first car was an old Rugby, and Mac used to say that the only thing he didn't have to use to drive it was his teeth. The gear used to slip out so he used to have his leg hooked over that, the windscreen wipers didn't work so he had to used his hands to do wobble wobble quick smart - but it was good, it got us places. Many years back we used to live in Surry Hills, and we used to drive down Riversdale Road, Camberwell, toward the railway line. Mac used to get up a bit of speed, go like mad down the hill and then bounce over the railway line. Terry would be sitting between Mac's legs and he would squeal with delight, "do it a den (again), Dad, do it a den!" Years later, one long weekend we all went down to Woolsthorpe to stay with Bid and Ted (White), and we started out early to come home as we had to go to work on the Tuesday. But we had nothing but trouble with the car. Mac said later if he had only stopped long enough to do what needed doing to the carburettor, we would have been all right. But people would stop and try to help us, and it got more and more muddled. After leaving Woolsthorpe about 6.30 in the morning, we were still driving through town about 2 on the Tuesday morning. The kids were so tired and so dirty and not at all happy. One time Bid and Ted were up from the farm at Woolsthorpe, and they were going to take my children back to the farm for holidays. But driving into the city, smoke came out from under Mac's seat. It turned out that Mac had a bag under there, in case he had a puncture or something, so he could lie on the road. But something, perhaps cigarette ash, set it alight, and there was a rush to get out and stamp out the fire. But it meant the kids missed the train to Woolsthorpe. As it happened, Jeanie was there seeing Bid and Ted off and we were racing down the platform thinking Jeanie was waving us on, but she was waving that it was too late. But the children went down the next day.